Local resident Kevin W. Shreve, CLU, ChFC , a financial professional with AXA Advisors, LLC in Ithaca, has recently attended the AXA Advisors Institute Program, hosted on the Harvard University campus in Cambridge, Massachusetts. The AXA Advisors Institute program provides Financial Professionals (FPs) with a deeper understanding of asset allocation wealth advisory strategies, portfolio management and the development of effective client relationships. The educational curriculum was developed in partnership with faculty from Harvard University and Case Western Reserve. Sessions focused on the latest research and practices o f experts from leading academic and financial communities including lectures from Harold Langlois, PhD, Kate Livingston, and Sam Thomas, PhD. 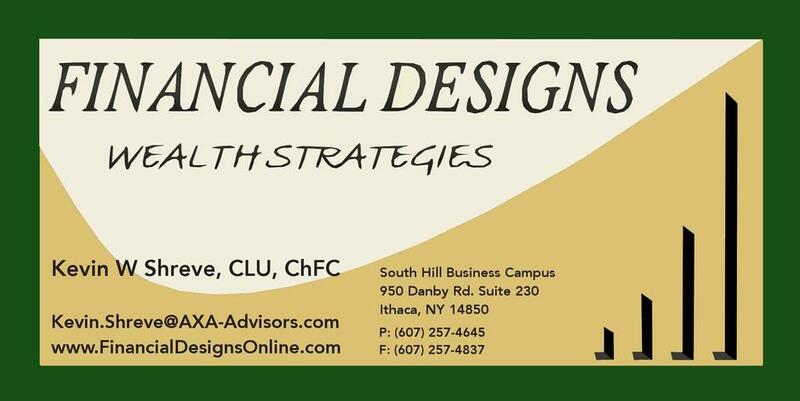 Kevin is one of the select financial professionals nationwide to complete this wealth management curriculum. Mr. Shreve of Financial Designs Wealth Strategies, believes that the key to helping clients achieve their financial goals is to view each client as a unique individual with unique financial needs. Our team approach to financial services includes Kevin and his staff, and most importantly, the client. Together, we help clients identify their financial goals, and then offer the support and advice they need to commit to achieving those goals. He has been awarded the title of Retirement Planning Specialist by AXA Advisors based on the receipt of a Wharton Certificate in Retirement Planning. Financial services available to individuals and business owners through AXA Advisors, LLC include: strategies and products for financial protections and investments; asset allocation, college, retirement, business and estate planning strategies; life insurance, annuity and investment products, including mutual funds. Securities products are offered through AXA Advisors, LLC, NY, NY, member FINRA, SIPC, 10104 (212) 314-4600. Insurance and annuity products are available through an affiliate, AXA Network, LLC and its subsidiaries. CFP® and CERTIFIED FINANCIAL PLANNERTM are certification marks owned by the Certified Financial Planners Board of Standards, Inc. These marks are awarded to individuals who successfully complete the CFP Board’s initial and ongoing certification requirements. “AXA is a brand name of AXA Equitable Financial Services, LLC and its family of companies including AXA Equitable Life Insurance Company (NY, NY), MONY Life Insurance Company of America (AZ stock company, administrative office: NY, NY), AXA Advisors, LLC, and AXA Distributors, LLC. In business since 1859, AXA Equitable Life Insurance Company is a leading financial protection company and one of the nation’s premier providers of life insurance, annuity, and financial products and services distributed to individuals and business owners through its retail distribution channel, AXA Advisors, LLC (member FINRA, SIPC) and to the financial services market through its wholesale distribution channel, AXA Distributors, LLC. AXA S.A. is a Paris-headquartered holding company for a group of international insurance and financial services companies, including AXA Equitable Financial Services, LLC companies. AXA S.A. is a worldwide leader in financial protection strategies and wealth management with 102 million clients in 56 countries as of December 31, 2013.